hen I grew up in the Bronx during the forties and the fifties we sure had our share ofcharacters. You found these "role" models in a variety of places. 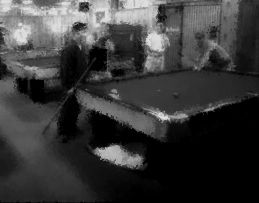 During the early fifties we discovered pool. After spending time in Hess' Pool Room, located along the way of Jules Vernes' Journey to the Center of the Earth, below ground level on 167th Street between the Concourse and Walton Avenue, we discovered an above-ground pool room above a Bar and Grill on Jerome Avenue between 167th and 168th Streets. It had all of two pool tables, a house full of guys and a scoreboard listing all the baseball games being played that day. It really seemed odd to a group of fifteen-year-olds that no one was shooting pool. We began playing and after a few hours we were finished and asked what we owed. No one seemed to know. It was then we met Lurky. He set the price at a dime a player. It only took us a few weeks to realize he was a bookmaker and everyone else were the clients. We were just a bunch of kids that wanted to shoot pool cheaply. Lurky was a terrific guy. We would see him in the 167th Street cafeteria and he wouldn?t hesitate to pay for our coffee and breakfasts. Of course we kept going to the pool room - after all, the price was right - until it got raided and the police let us go with a warning that next time our parents would have to pick us up at the station house. Meyer the Candystore owner was the first entrepreneuer I ever met. Actually, I didn't find out he was an entrepreneuer until I took economics in high school. If ever someone could "hustle" to make a buck it was Meyer. He would not only make you an egg cream but for a dollar he would pick up you car license plates or registration renewal. He would also cash your check and hold it for a day or two if you were short of cash. Need a ride to the Catskills, Meyer would either drive you himself or arrange a ride - for a fee, of course. The bowling alley on 170th and Jerome had its share of local characters. "Nickels" and "Dimes", two brothers, hung out there. I haven't any idea how they got those nicknames other than "Nickels" was the smaller of the two. They were always pulling off some stunt. I remember when they arranged a race around the block. Down Jerome Avenue, up a side street to Cromwell Avenue to the end at 170th Street and back to the bowling alley on Jerome. It seemed simple except for one small problem: one of the runners was skinny and the other fat. So, in the same manner in which horses were handicapped, since money was to be bet on the race, the lighter of the two had to carry a couple of duck pin bowling balls in a knapsack on his back. I'm still rolling on the floor everytime I think of the small thin guy trying to run with the dead weight of the bowling balls on his back.